I've written an earlier review below dated 14/4/14 after my eldest daughter Emily passed her driving test. At the end of that review I promised that when my younger daughter was of driving age I will employ Garry to teach her also. Well I can't believe it's now two years on and with Garry's expert tuition my younger daughter Lucy passed her practical test on Friday 22/4/14 on her first attempt and with only 2 minor faults. It's a daunting uphill process for any person, young or more mature, to learn to drive, but Garry breaks it down into manageable sections until students are totally proficient with all the skills to not just pass the test but have a long safe driving career. 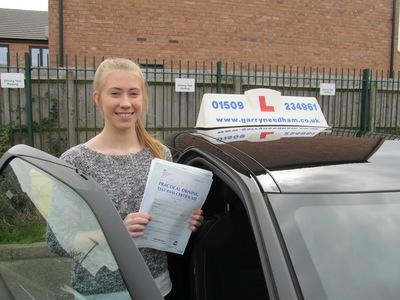 Lucy wasn't exactly a natural to begin with but with Garry's patience she grew in confidence, and the very next day after passing her test she drove solo into Loughborough town centre! Writing from a parent's perspective it's important that my children are not just test standard but fully equipped with the skills required to deal with all the conditions you meet on the roads today. If I had more children, which I don't, Garry would be teaching them too. Thanks for all your help Garry and we will continue to recommend you to anyone who's might be looking for an instructor.